The ConceptDraw DIAGRAM is a professional software for creating great looking flowcharts. The samples included in this set of software allows users to draw any type of flowchart. The vector stencils from object libraries allows you to use RapidDraw technology. By the clicking on direction arrows one can add new object to flowcharts. Sample 1. Flowchart: Planning process. This business management flow chart example shows planning process steps and logic. Collaboration software for small and medium business allows communicate with partners around the globe via Skype. Process Flow Chart is a visual illustration of overall flow of activities in producing a product or service. How do you make a Process Flow Chart usually? Drawing process flow charts, diagrams and maps is quite complex and lengthy process, especially if you draw free-hand. But now thanks to the ConceptDraw DIAGRAM v12 diagramming and vector drawing software extended with Flowcharts solution from the "What is a Diagram" area of ConceptDraw Solution Park this process became simple and fast. A confirmation of this can serve many Process Flow Chart examples included in Flowcharts solution. Create your own flow charts of purchasing business processes using the ConceptDraw DIAGRAM v12 diagramming and vector drawing software extended with the Accounting Flowcharts solution from the Finance and Accounting area of ConceptDraw Solution Park. 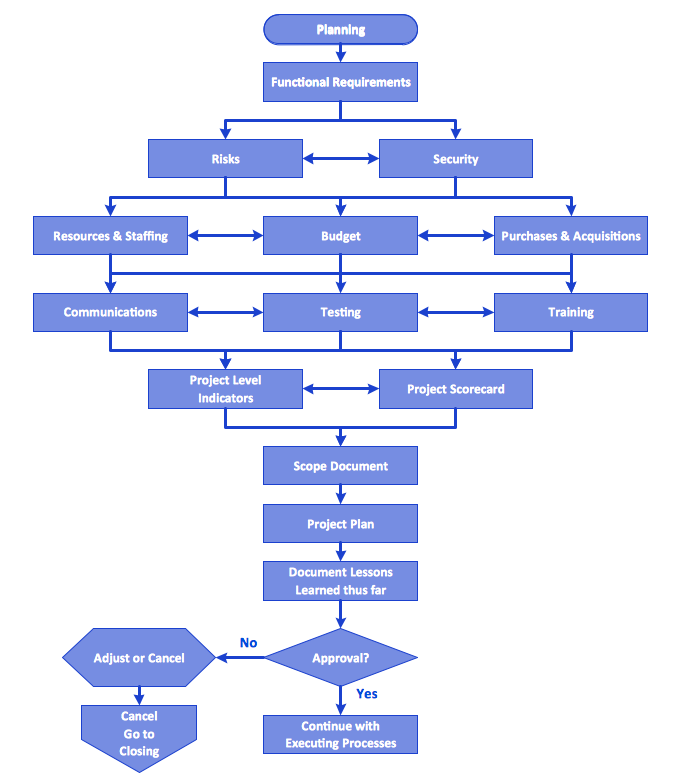 The flow chart example shows the steps of purchasing business process. One of the most popular option helps to draw diagrams faster is pre-designed set of examples related to each kind of diagram. ConceptDraw DIAGRAM v12 software extended with the Workflow Diagrams solution delivers a complete set of workflow process examples helps you to start making your own workflow faster. What is Purchasing Process and How to Meet The Standards. Common key elements of purchasing process representation. Picture: Why is it important to have a formal purchasing process? Purchasing Flowchart - Purchase Order.